According to SAP, you need neither have any programming knowledge nor use a Script language to adapt standard forms. 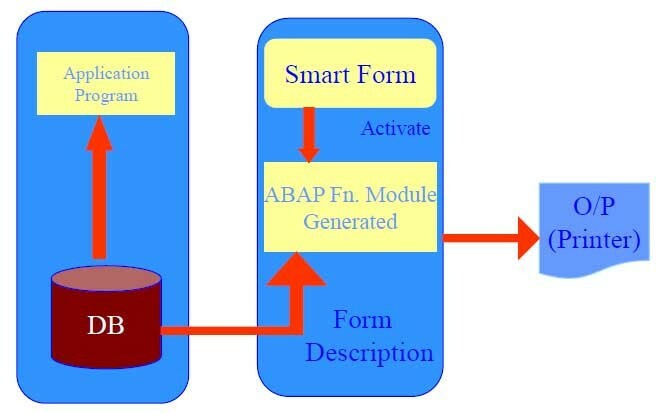 However, basic ABAP programming skills are required only in special cases (for example, to call a function module you created or for complex and extensive conditions). Make used of the Table Painter and declare the Line Type in Tabstrips Table e.g. HD_GEN for printing header details, IT_GEN for printing data details. * Calling SMARTFORMS from your ABAP program. * At the end of your program. In R3 also, you can download into XML format. However, it's not sure about uploading. Refer to the program 'SF_XSF_DEMO'. In 4.7 Enterprise, other have seen this utlity which is completely missing in 4.6c. There is functionality to download a complete form or only a particular node. (Utilities -> Download form). It will create a XML file and save it in the hard disk. For others, if you want to download/upload the Smartforms source, you will need the help from the Basis people. What you can do is to create a Transport and then FTP down to your local harddisk. When you need the Smartform source in another system, you have FTP up the Smartforms file back to the SAP server. Finally, the Basis team, will tp it into your system. g) The protect and and protect command in sapscript doesn't work with smartforms. For example on an invoice: First data of position no 80. is printed on page one, other data of position no 80 is printed on page 2. And there's nothing you can do about it. Actually, there is something you can do about it. By using a folder node and checking the 'protect' checkbox, everything in that folder will be page protected. You should use 'SSF_FUNCTION_MODULE_NAME' & call function fm_name in your program & not others. data : it_flttab like table of sflight. Data : g_salary type i . * it_flttab type standard table of ty_flt. corresponding fields of table it_flttab. There's a DDIC Table called "Ugyfel" containing 5 rows. I'd like simply to display all the rows on a SF's Main window. Please follow this process to display the value from your table "Ugyfel"
9. Go to the form painter adjust the main window. 11. Name: loop1, desc: display loop. 12. Internal table ktab into ktab. 14. name : text1, desc: display text. 15. Go to change editor. 1. go with abap editor se38. 3. parameters: test like ugyfel-. 4. data itab like ugyfel occurs 0 with header line. 5. select * from ugyfel into table itab where field1 = test1. Save and activate the program ( ^f 3). Create a loop around the table. Put a Command node before the table in the loop that forces a NEWPAGE on whatever condition you want. Then only loop through a subset of the internal table (based on the conditions in the Command node) of the elements in the Table node. There you can create Paragraph formats etc just like in sapscript. Then in your window under OUTPUT OPTIONS you include this SMARTSTYLE and use the Paragraph and character formats. Either you can use a window that takes up the width of your page and only has a height of 1 mm. Then you put a frame around it (in window output options). Thus you have drawn a box but it looks like a line. Or you can just draw "__" accross the page and play with the fonts so that it joins each UNDER_SCORE. The Difference is as follows. Form Interface is where you declare what must be passed in and out of the smartform (in from the print program to the smartform and out from the smartform to the print program). Global defs. is where you declare data to be used within the smartform on a global scope. ie: anything you declare here can be used in any other node in the form. Once you have activated the smartform, go to the environment -> function module name. There you can get the name of funtion module name. The key thing is the program that calls it. for instance, the invoice SMARTFORM LB_BIL_INVOICE is ran by the program RLB_INVOICE. This program uses another FM to determine the name of the FM to use itself. The key thing is that when it calls this FM (using a variable to store the actual name), that the parameters match the paramters in your smartform. Another thing to note is that the FM name will change wherever the SF is transported to. So you need to use the FM to determine the name of the SF. It checks to see if the sf_label starts with a '/', which is how the internal names start. if it does, the name has already been converted. If not, it calls the FM and converts the name. You would then CALL FUNCTION sf_label. Within a form you can use the field string SFSY with its system fields. During form processing the system replaces these fields with the corresponding values. The field values come from the SAP System or are results of the processing. Displays the date. You determine the display format in the user master record. Displays the time of day in the form HH:MM:SS. Inserts the number of the current print page into the text. You determine the format of the page number (for example, Arabic, numeric) in the page node. Displays the total number of pages for the currently processed form. This allows you to include texts such as'Page x of y' into your output. Contains the total page number of all forms in the currently processed print request. Contains the name of the raised exception. You must trigger your own exceptions, which you defined in the form interface, using the user_exception macro (syntax: user_exception ).